The Greek Gods has launched a new yogurt product that contains Chia seeds. It comes in four flavors: vanilla, strawberry, peach and blackberry. The yogurt is sold in 5.3 o.z single serve cups. The chia seeds and vanilla or fruit is on the bottom. The Greek yogurt contains 12 grams of protein per serving (1 container). They contain 140 calories or less per container and about 16 to 20 grams of carbohydrates. 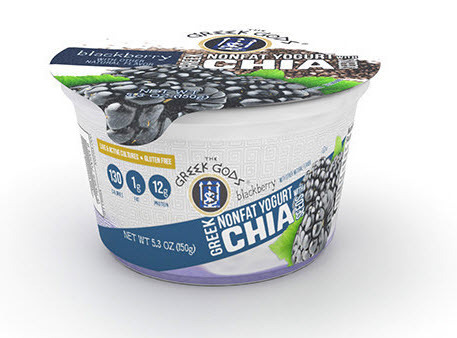 Basel Nassar, CEO of the Hain Refrigerated Foods Division, says in a statement, "Our new Greek Yogurt with Chia Seeds provides a great single serve option for our customers on the go. The creamy nonfat Greek Yogurt our fans expect from The Greek Gods blends very well with the added texture and flavor of the fruit and chia seeds. We are excited to bring these items to market."